How was the post-modernist project contested, subverted and assimilated in India? This book offers a personal account and an intellectual history of its reception and response. 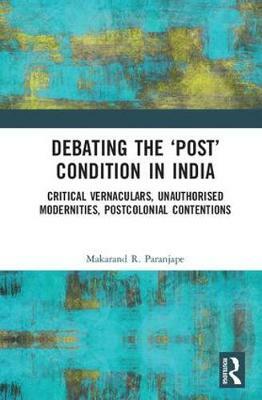 Tracing independent India's engagement with Western critical theory, Paranjape outlines both its past and `post'. The book explores the discursive trajectories of post-modernism, post-colonialism, post-Marxism, post-nationalism, post-feminism, post-secularism - the relations that mediate them - as well as interprets, in the light of these discussions, core tenets of Indian philosophical thought. Paranjape argues that India's response to the modernist project is neither submission, willing or reluctant, nor repudiation, intentional or forced; rather India's `modernity' is `unauthorized', different, subversive, alter-native and alter-modern. The book makes the case for a new integrative hermeneutics, the idea of the indigenous `critical vernacular', and presents a radical shift in the understanding of svaraj (beyond decolonisation and nationalism) to express transformations at both personal and political levels. A key intervention in Indian critical theory, this volume will interest researchers and scholars of literature, philosophy, political theory, culture studies and postcolonial studies.